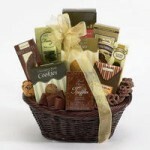 Nothing says Happy Holidays like a gift basket filled with chocolate fudge, pretzels, biscotti and more. These delicious treats will leave everyone in good spirits. Have a basket customized or personalized to your clients, employees or friends taste today.